I would firstly like to thankyou for sending me the glossy brochure to purchase some tickets for the test match against the Boks on 2 Aug 2003 at Lang Park. I am so glad that it scans in so well and I can use it to highlight a couple of issues as I will discuss below. The ticket offer was for QRU season holders and I must say how delighted I was at being offered an advance purchase of tickets. However, the quality of the seating is enough to make me want to blow chunks (and I don�t mean my neighbours dog). At Ballymore, the Qld home of rugby union, I get to sit between the halfway and 10m line. What on earth makes you think I would like to sit on the corners coloured gold with a poxy red line around them? I am sorry but is this the best you can offer someone who saves up to buy their annual Reds Super 12 season ticket? I mean you want me to pay $77.85 per ticket $5.50 for a booking fee to overlook the sandpit from the corner? That price for two tickets is equal to over 4 months of Foxtel subscription and that gets me the entire Super 12 coverage plus some internationals. None of which are available free-to-air. I mean you used to offer us seats on the tryline so we could see who crossed the line. Now we will be hard pressed to work out if the kick went through or not as we would be sitting behind the dead ball line on an angle. I do not plan on spending my money just for the atmosphere and watching one of the two big screens to actually see the game. Lang Park appears to have more sand on it than most beaches in NZ. The ground is going to be ripped apart by the first scrum and is going to be the cause of massive injuries in its current state. I mean even a jellyfish has more backbone than that surface. I would hate to actually discover the cost to go and sit in a good seat and I wonder how you actually get to sit in one as the best most of us Joe Publics and QRU supporters can get are the silver ones at the end of the stadium. Can I truly say, thankyou for denying genuine rugby followers access to decent seats at a reasonable price. Please continue your �gold rush� policy as I am sure your coffers are doing well. 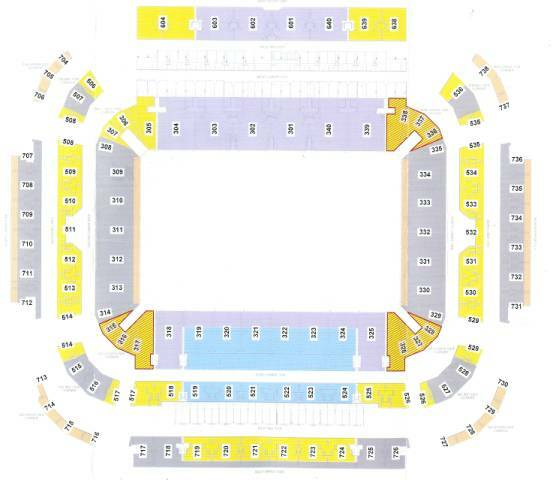 By the way with the no pre-sold seating at the RWC the entire blue section on the diagram is the SUNCORP MEMBERS area. I hope these were not pre-sold and how are you going to get around the issue of the stadiums name during the RWC? Yours sincerely a wallaby supporter staying at home. P.S. You are really lucky my wife didn�t let me send this to you in its current state as she was worried you would start a defamation case against me. Don't worry Geeves, by posting this letter on Rugbyheads you are pretty much guarenteeing that the authorities won't see it. If anyone did actually read most of the crap that gets written on this site then I would have been locked up years ago. Supposedly this article has been viewed 2431 times since we bothered to start counting*.